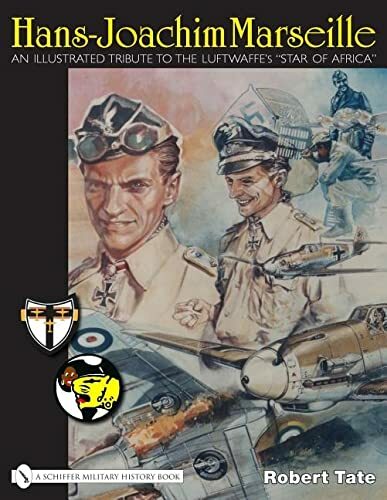 Robert Tate Hans-Joachim Marseille: An Illustrated Tribute to the Luftwaffe's "Star of Africa"
Hans-Joachim Marseille: An Illustrated Tribute to the Luftwaffe's "Star of Africa"
This new book is a look at the man better known as "The Star of Africa" on the 65th anniversary of his death - legendary Luftwaffe ace Hans-Joachim Marseille. Tate takes a look at Marseille\s personality, flying skills, physical attributes, tactics, and victories through the words of historians and the men that flew with and against Marseille in the North African desert. With over 260 b/w and color photographs - some never before published - maps, and diagrams, this book is truly a one of a kind and unique look into the career of Hans-Joachim Marseille.